The emailer was Nadia. She introduced their company. "Pacetech is the official exclusive distributor, local supervisor, appointed partner of local dealer selection and worldwide promoter for some major brands like Melody Valve Amplifiers. I deal with export customers and distributors globally to be the press contact here at Pacetech. We would like to submit to your attention our newest product release from Melody: the Pro 34 and Pro 88 models. The product range we distribute now is only meant for Western countries so it is a brand-new series of tube electronics." By return email I confirmed familiarity with Melody's Mr. Wang—I'd visited him in his PRC facility many years ago—and also with his prior European importer. "Pacetech have handled Melody since 2011 and yes, the previous company could have done a better job. We've been working hard and still are at reestablishing the brand in the market and are proud to say that our efforts are paying off. Many customers and dealers are moving their attentions away from the dominant classic brands and to our Melody range instead which is gaining more interest all over Europe to have greatly expanded our sales network." In December 2006, our then Aussie correspondent Warwick Freemantle had generously submitted this report of his visit to the People's Republic of China and Melody. By December 2008, I had my own opportunity to visit Mr. Wang at his facility outside Shenzen to produce this 12-page pictorial report. 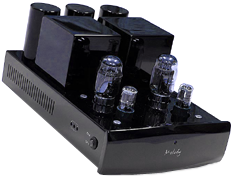 The Melody 212 Everest mono amps combine, on one deck, one each Western Electric 373A and 429A, then a 274B and 212 for 50 watts of class A SET power with a claimed response of 18Hz - 30kHz ±0.5dB, an input sensitivity of 1.3V, an SNR of >86dB, dimensions of 34 x 41.5 x 88mm WxHxD and a massive weight of 75kg/ea. At the time he'd been in the midst of assembling an enormous collection of vintage tubes stored on the roof of his factory. He wouldn't divulge their various identities to avoid driving up prices whilst he quietly built up an enviable inventory for future amplifier and preamp models. When Psvane finally reissued Western Electric's big 212, Mr. Wang's part of the collection housing original WE 373A, 429A and 274B could lift its news embargo and reappear on the global scene put to good use in the sleek 212 Everest monos above. Obviously those are extreme flagships and for deep pockets. The two new 'everyman' models deliver virtually the same power in a single chassis and include a linestage to eliminate the need for a separate preamp. At €2'000, the class AB1 Pro 88 with remote control includes its own exotica by way of a pair of XF184 noval pentodes and a quad of 6BA11 12-pin double pentodes. At 45wpc, the matching Pro 34 integrated with remote-controlled volume runs the same 2 x XF184, then adds 2 x 3EJ7 noval pentodes and 2 x 5BK7. The Platinum 211 integrated gets two 4P1S, the Platinum 845 two 6EM7, the Platinum 101D preamp two WE404A. Mr. Wang's years of secretive globe scouring for NOS valves are paying off it would seem. With Pacetech in charge of EU distribution and support for Melody's new export models, one should expect proper customer service and fluent communications in English. But Pacetech can't stop the transshipping web operators who sell heavily discounted gear direct through Singapore or Hong Kong. Squashing those outfits is virtually impossible. With them it's a very blunt caveat emptor! Only complete tossers expect formally appointed dealers who sell authorized goods to then service and repair grey-market variants of dubious provenance. With Pacetech-appointed dealers, there's a 3-year warranty. It's a back-handed credit to the desirability of Melody products that back-door operators continue their shady practices. 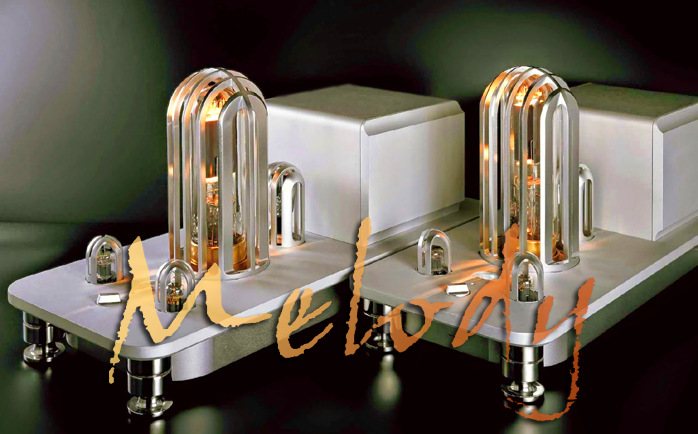 A credit of the proper kind is that the privately owned/operated Melody plant produces Mystère as the pentode sister brand to the triode/ultralinear PrimaLuna products. Both are owned and sold by the Dutch Durob Audio company who also run the Ah! Tjoeb brand. PrimaLuna kit is built by the government-owned Cayin/Spark conglomerate. The 'dripping wet' black lacquer of Mystère gear and its styling give away its Melody origins. Clearly Allen S. H. Wang keeps himself busy. He founded Melody in Australia because he had a shop in the Melbourne suburb of Bayswater. He later relocated to China for more cost-effective manufacturing. Word from Nadia is that he might move back to Oz in the near future. Despite having been in business for a good decade with numerous very favourable reviews in the Western press, for many there remains an attached stigma to being designed and built in the PRC. Of course over the past 5 years, we've seen Chinese hifi come a very long way. Today brands like AURALiC play at the very top of their chosen price sector. Melody have always been about valve gear. It's likely that in the public eye they got inadvertently mixed up with the glut of affordable tube kit which exploded out of China about 10 years ago. Unlike Melody, much of it was poorly made and unreliable. Many dealers who sampled it early soon soured on what became known as ChiFi. They moved on. Because Melody products enjoy a very good reputation, they always were and remain targets for unscrupulous grey marketers. That their activities undermine and potentially fracture solid dealer networks is obvious. What further confuses the issue are things like Dagogo's May 2014 review opening with a photo of the Aodixun P2688 preamp which US importer Angel City Audio lists at $6'999. 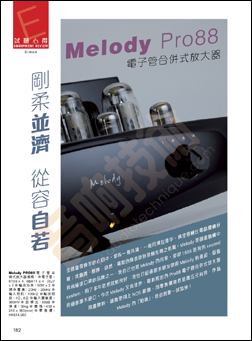 Meanwhile Pacetech's website shows the same unit as a Melody Platinum 101D for €14'000. That's more than double if you factor currency conversion rates. On Angel City Audio's website, we find a Melody PM845 model listed at $8'499. That looks identical to what Pacetech call the Dark Power 845-2 monos at €10'800/pr. Web surfers will wonder what distinguishes them apart from price. If the Pro 88 is a pure export model as Nadia told us, what is it doing on the cover of issue #379 of Audiotechnique? Why did Melody supply that loaner? Surely Chinese expats living abroad have little to no access to a Sino print magazine to warrant promotion of an exclusive export product in its pages. Here one might conjecture that Mr. Wang's decision to establish Melody in mainland China continues to confuse some of his international efforts due to cultural differences at home which conduct business with a different set of priorites. Had he embraced Australia's higher cost of doing business and stayed out of China altogether, Melody today might be the Rogue Audio or even Audio Research of the East. If that is not how people think of them, my prior exposure to Melody gear suggests that this isn't due to the product itself. Just like customers, audio writers simply cannot sort out surrounding perception issues. To comply with EU regulations—the same which have given us those plastic-shrouded speaker terminals—the Pro 88 and 34 models come with a removable gloss-black metal tube cage. Unless you have toddlers, you'll most likely never use it to instead enjoy looking at the deck of ten glow bottles directly. With four RCA inputs but no output, subwoofer hounds will parallel up on the speaker connections which here sport the usual 8/4-ohm option. The power mains is on the left cheek ahead of its bias trim pots. Aside from volume and source selection controls, the fascia is blessedly free of buttons and only adds a low orange power LED and above it the infra-red eye for the volume up/down and mute remote wand. The 6BA11 of the Pro 88 are original RCA issue, the XF184 Mullard. Only the KT88 are current Shuguang production. Cosmetically the Pro 88 and Pro 34 continue the established Melody theme of timeless elegance rather than steam punk. And they stay clear of the garish blue lights and odes to CNC chops that ran rampant with early Shanling and Raysonic gear. On price these latest Melody integrated are aggressive competitors to the Serbs at Trafomatic and Auris, to the Italians of MasterSound and Unison Research, to the Germans of MF Electronics and Octave, to the French at Jadis and so forth. Good value has always been a hallmark of the Melody brand and is part of its appeal. In Melody's catalogue, KT88s have always figured. The Dark Power KT88-4 monos ran a quad of kinkless tetrodes driven by 4 x 12AU7. The matching KT88-2 monos which we reviewed 8 years ago had 6SN7 drivers instead. The half-width Dark KT88 Esprit integrated stuck to 6SN7 whilst the integrated called just KT88 added a 101D direct-heated triode. It seems fair to say that Allen S.H. 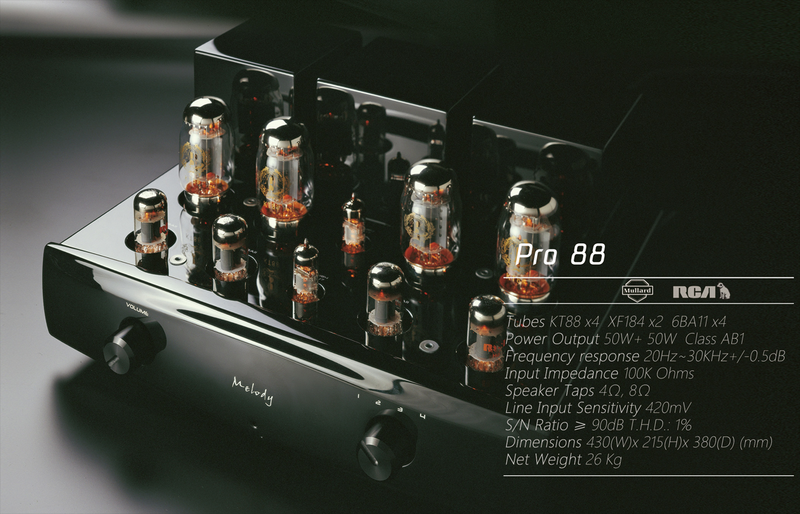 Wang has had considerable time and opportunity to explore various tube combinations and circuit refinements around the KT88. Presumably his latest move to exotic new-old-stock bulbs signifies a highlight along this well-traveled route. Valve amp fanciers should thus take note that Europe seems set to shortly welcome two interesting fairly priced options with remote control which are from a well-established maker and sport some small-signal bottles we've not seen before.